Every evening, one of our guides will meet with you in the hotel bar to inform the explorations planned for the following day and help in the difficult task of choosing between available alternatives, all exciting . The examinations were conducted in groups of no more than 8 passengers, accompanied by a bilingual guide explores. Taken together, scans allow you to discover the landscapes and wildlife of this unique place, the diversity of ecosystems and living beings who lived here for millions of years, and the singular forms of life its inhabitants: the gauchos. Here's a sample of the main explorations we offer in Patagonia. Note that daily offer only a selection of these and that the pathway described in each may vary. It also scans can be modified at any time due to weather or other circumstances beyond our control. Duration: 3 hours (half day) . Walking 2.5 hours. itinerary: Leave explora by van (10 min) toward the Pudeto Refugio. Walk on Lake Pehoe through the Salto Grande and towards the Massif until reaching the vista point of Lake Nordenskjold. Spectacular view of the French Valley, the Paine Grande Massif and the Horns. Note: Frequent strong winds. Duration: 2 hours (half day) . Caminado 1,5 horas. Duration: 3 a 3,5 hours (half day) . Caminando 3 a 3.5 horas. itinerary: Leave explora walking. Walk Ascend 250 m level culminating on ledges overlooking the Massif, southeastern hills, Bay of the Condors and Pehoe and Nordenskjold lakes. The road continues along the cornice, small lakes and forests above the Paine River, with views on the merits of the Sierra Prat, Serrano Prairie and Lake Toro. Descend the Quebrada La Feria. Duration: 2.5 a 3 hours (half day) . Caminando 2 a 2.5 horas. guanacos and other birds, there is also a wide variety of flora in the spring season. Views of Lake Sarmiento on your extension. Return by van (20 min). Duration: 4 a 5 hours (half day) . Caminando 2.5 a 3 horas. Salmon. Great variety of birds and lush vegetation. Return to the Grey, back in van (40 min). Duration: 2 horas caminando. Walking Tour: 4 km. itinerary: Leave explora walk, walk with sweeping views of the park, allowing the observation of different plants and bird species. Up to the lookout of the condors 250 m level, down to Lake Pehoé and return. Duration: 4 hours (half day) . Caminando 3 horas. Pingo Valley. Vision lakes Grey, Pehoé, Nordenskjold and Sarmiento. Return by van (40 min). Duration: 3 a 4 hours (half day) . Caminando 2.5 a 3.5 horas. inhabitants of the region. Abundance of guanacos. Gradual decline Nursery Laguna Amarga. Return by van (35 min). Duration: 3 hours (half day) . itinerary: Leave explora by van to the Quincho, with emphasis and photographic knowledge of the flora and fauna of the park. On the way you can observe numerous and varied wildlife: guanacos, rheas, condors, foxes, skunks, ducks, geese, and generally varied species of birds particularly in spring. Views of the Cuernos and Torres del Paine, Cerro Almirante Nieto and Paine River Cascades. Back in van (1 hour). Duration: : 4 a 5 hours (half day) . Caminando 2 a 3 horas. itinerary: Leave explora by van to the Quincho (1 hour). Walk from northeastern end of the Blue Lagoon on the north shore to the Mirador Torres del Paine. Ñirre lenga forests and views of the Torres del Paine and Laguna Azul. Abundant flora and birds of the region. It can be done before or after the roast in Quincho. Duration: 10 a 11 horas (día completo). Caminando 4 a 6 horas. itinerary: Departure from explora by boat (30 min). Hike from Refugio Grey to Refugio Pehoé overlooking the Grey Glacier, icebergs in Lago Grey, Southern Ice Fields, Andes, and Paine Grande Massif Olguin. Picnic lunch near the glacier. Return by boat across Lake Grey (2 hours) to approach the walls of the glacier and then by van from Grey to explora (40 min). Note: The boat crossing is dependent on climactic conditions. Duration: 5 a 6 horas (dia completo). itinerary: Leave explora by van (10 min.) To the Quebrada La Feria. 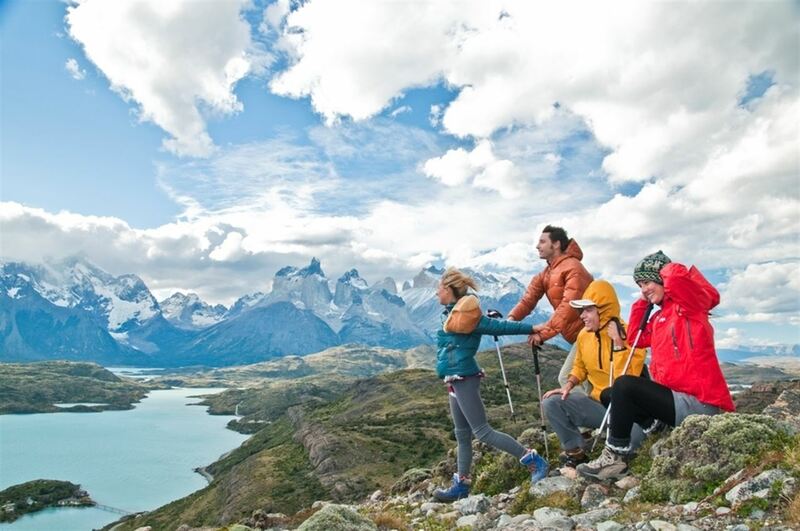 Walk on the rise with a drop of 250 m, overlooking the Paine Massif and Rio Paine. Continuing inland valleys with lakes and beech forests. Picnic lunch. Path continues to Lago del Toro Heights with spectacular views of the park (360 º). Down to the Weber Bridge. Return to explora by van (15 min). Duration: 7 horas (día completo). Caminando 6 a 7 horas. itinerary: Out walk explores the trail to the Buitreras (Condor Nest), rise of 200 m. The trail passes through native beech forest and reaches the Laguna La Cal, special training where you can usually see the Patagonian wind. In spring lake fauna abounds. Awesome view of the Cuernos del Paine and Lago Sarmiento with calcium formations. Return by van (20 min). Duration: 7 a 8 horas(dia completo). Caminando 6 a 7 horas. itinerary: Leave explora by boat (30 min) to the shelter Pehoé. Walk path along the Lake and then Lake Pehoé Skottsberg with a drop of 150 m (rise). Spectacular views of the lakes, the Paine Grande and Cuernos del Paine. Suspension bridge crosses the French River to have seen the French Glacier, Summit Principal Paine Grande and Cuernos Main and North. Picnic lunch and return walking to the Refugio Pehoé. Return by boat to explora (30 min). Duration: 10 a 11 horas (dia completo). Caminando 8 a 9 horas. itinerary: Leave explora by van (1 hour) to the Estancia Cerro Paine. Walk on the rise with a drop of 350 m by Valle Ascencio to the Chilean camp. Intermediate zone crossing ancient beech forests and streams to Camp Torres. Uploaded by moraine to the viewpoint overlooking the lagoon from the Torres del Paine (350 m level). Picnic lunch and return walking to Estancia Cerro Paine view of multi-colored lagoons. Return by van to explora (1 hour). Note: The scan requires significant physical exertion. itinerary: Leave explora by van (40 min) toward the Grey. Walk along a trail without much drop that follows the rushing water glaciers Pingo River, through open meadows and lush vegetation. Step Salmon River and slight rise (200 m level). Native lenga forest, overlooking the Cerro Paine Grande and Rio Pingo Cascade. Picnic lunch and return walking to the Grey. Return to explora by van (40min). Duration: 1,5 horas, en un recorrido de 4 km (2.4 mi). itinerary: Will depart from the Hotel Salto Chico to the stables explora (15 min). The ride begins with a gentle climb up to reach the vicinity of Lake Toro. During this quiet but very attractive ride, you can see different species of birds representatives of the local avifauna, characteristic features of the geomorphology of the park and part of the regional flora. Excellent views of Lake Toro and Serrano River flanked by great mountains of the Andes lace are appreciated. It returns to the stables, where we expect the van back to the hotel (15 min). Duration: 1 a 1.5 horas de cabalgata (medio día). itinerary: Leave explora by van to the Quincho (1 hour). The Quincho is part through ñirre and lenga forests, overlooking the Sierra Baguales, Las Chinas River, Cerro Almirante Nieto, Torres del Paine and Cerro Nido de Condors. Step through the room and returns to the Blue Lagoon Quincho along Las Chinas River. Note: Can be done before or after roasting in the Quincho. Duration: 3 horas de cabalgata (medio día). itinerary: Leave explora by van to the Quincho (1 hour). A horse crosses the Rio Zamora, through sectors pampa, Laguna Jara and reaching the Estancia January 2 at the base of Cerro Obelisk, the Zamora River canyon. Ability to see condors and eagles. View of Sierra Baguales and Torres del Paine. Note: Requires actual prior riding experience. It can be done before or after the roast in Quincho. Duration: 2 horas de cabalgata (medio día). itinerary: Leave explora by van to the Quincho (1 hour) A horse crosses the Río Zamora. Ups and downs in the Quincho area surrounding hills, arriving at the Estancia Santa Gemita. Return for cliff areas. Possibility of watching condors and eagles. Spectacular views of the Torres del Paine and the Blue Lagoon. It can be done before or after the roast in Quincho, . Duration: 6 horas (dia completo). A caballo 5 horas. itinerary: Leave explora by van (15 min) to the stable. Narrow trails through forests, lakes and plains. View of Cerro Donoso, one of the least explored areas of the park, and as such, an unspoilt nature. Pinic close to the Choros Laguna lunch. Pampas, streams, mountains and lush flora are among the attractions of this ride. Return by van (15 min). Duration: 3 hours (half day) . A caballo 2 horas. itinerary: Leave explora by van (15 min) to the stable. The ride begins crossing the pampa Serrano and the trail skirts the deep turquoise waters of the Serrano River, overlooking the Monte Balmaceda, covered with eternal snow. Return through the golden grasslands of the Pampa Serrano, overlooking the Cuernos del Paine. Return by van (15 min). Duration: 4 hours (half day) . A caballo 3 horas. itinerary: Leave explora by van (15 min) to the stable. The ride begins with the neighboring pampa to the stables towards the campsite Las Carretas. Vista al Lago Grey and icebergs. Picnic lunch in the sector. The ride continues to the shelter Pehoé, spectacular views of the Paine Massif, Lake Pehoé and lace Andes. Return by boat from Refugio Pehoé (30 min). Nota: La travesía en lancha depende de las condiciones climáticas. Duration: 4 horas hours (half day) . A caballo 3 horas. itinerary: Leave explora by van (15 min) to the stable. The ride starts at the east bank of the Rio Paine to the Quebrada La Feria. Cavalcade rising to 250 m elevation, views of the Paine Massif and Rio Paine. Continuing inland valleys with lakes and beech forests. Path continues to Lago del Toro Heights with spectacular views of the park (360 º). Down to the Weber Bridge and return to the stables. Return to explora by van (15 min).